When you face one of the youngest teams in the NBA, you know you are going to get a lot of run and fight, but tonight the Wizards had all they could handle in the season opener for both teams in Orlando and it took until the final seconds of game to decide the winner of this game, or so we thought. 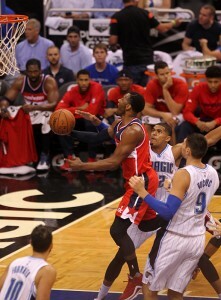 Protests from the Wizards’ bench ensued after what was a sure goal tending call or missed call . A replay review followed, and officials at the NBA’s replay center in Secaucus, N.J., overturned the goaltending, resulting in essentially a non-call. The ball would go back to Orlando with 3.5 seconds remaining. The Magic was given one last opportunity to take the lead and the game from the Wizards, but it was Marcin Gortat to the rescue for the Wizards as he stepped in from of Nikola Vucevic to make sure the Magic didn’t get another chance to win this game. 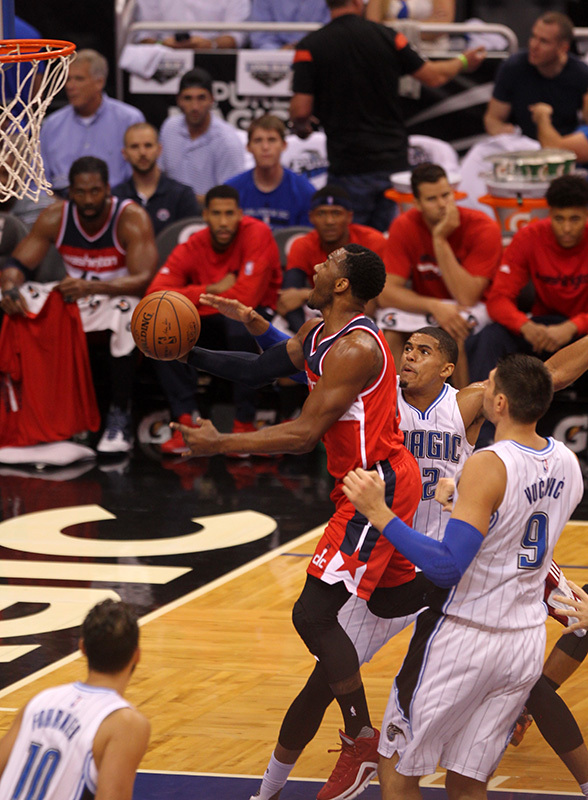 Wall finished with 22 points, seven rebounds, six assists, three steals and a career-high five blocks. Washington had the best back court action they have seen in a long time with Bradley Beal adding 24 points, in a roster that now featured NENE coming off the bench and Marcin Gortat starting at center and Otto Porter at the forward position with Kris Humphries in at the power position. The Wizards need to do a better job on total shot selection, as they shot a dismal 39.3 percent from the floor, 25 percent from three-point range and 60 percent from the free throw line. They matched their 17 assists with 17 turnovers and went more than four minutes without a point in the third quarter. Orlando took a 78-70 lead with 7:09 to go and then gave up 12 consecutive points. Orlando recovered, pulling ahead 87-82 with two minutes remaining. And, then, Washington closed out the game by scoring six unanswered points. Prior to the opening of tonight’s game both teams paid tribute to the late Flip Saunders, who passed away at the Age 60 on Sunday.